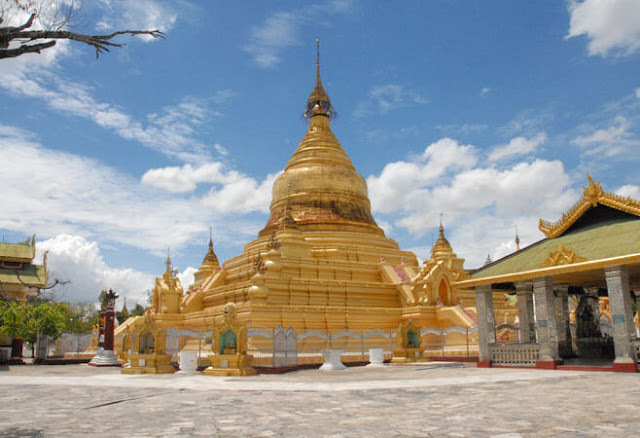 With many beautiful beaches such as ChaungTha or Thande, it is intelligible that Burma beach holidays area popular choice for many tourists who would like to visit the “the country of gold pagoda”. However, there are a lot of other destinations on the mainland that you should put in your must-visit list when traveling to Burma. One of them is called “the world’s largest book”. You are likely toimagine a massive leather tome in some library but actually, the world’s largest book is at Kuthodaw Pagoda in Madalay. 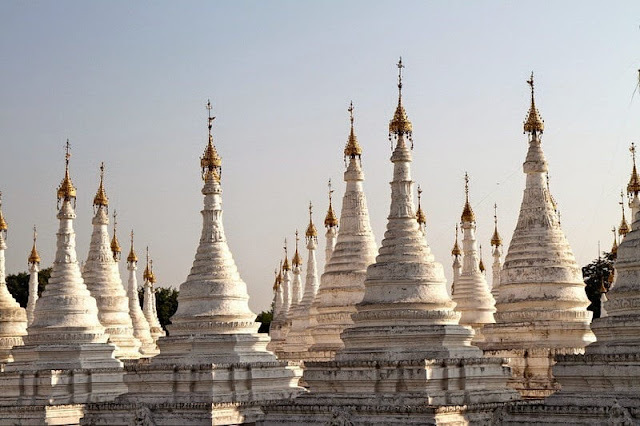 Kuthodaw Pagoda, which includes a giled pagoda, hundreds of shrines housing inscribed marble slabs and a lot of pavilions, is a Buddhist stupa at the foot of Mandalay Hill. The large grounds offer good views upwards of Mandalay Hill with its many temples and pagodas. The main entrance to the grounds is the ornate, gold and red South gate which is adorned with sculptings of deities and animals from Buddhist and Hindu mythology. From there, a long corridor leads to the stupa at the center of the grounds. You will see many muralpaintings from the late Konbaung period (second half of 19th century) adorn its walls. Also,there is a pavilion enshiringanimage of the Buddha at the end of the corridor. The pagoda was built as a part of the traditional foundationof the new royal city of Mandalay during the reign of King Mindon Minas. 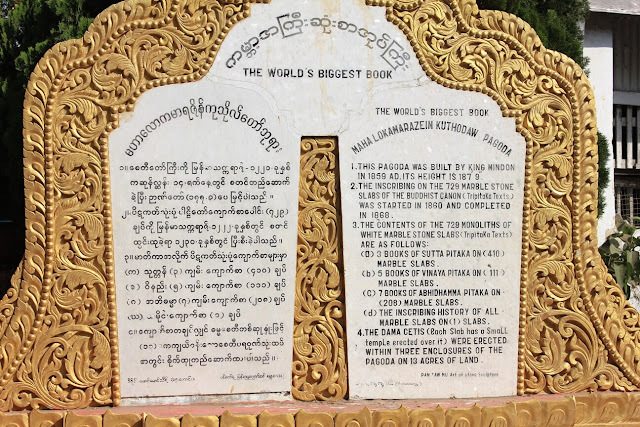 When the British invased Burma,worried that the teaching of Gautama Buddha may be lost, King Mindon conceived the idea of preserving the entire text of the TipitakaPali Canon of Theravada Buddhism by inscribing them in huge stone slabs. The work began in1860 and took 8 years to complete. Each slab is a meter wide and a meter and a half tall, and 13 centimeters thick and there are 730 slabs in total. The actual text of the TipitakaPali Canon consumes 729 tablets and the last one records how it came into being.Each one is called “kyauksagu”, with a precious gem on top and they are arranged in neat rows around the central golden pagoda. Nevertheless, when having invasion Burma, the British stripped away every piece of gold from the tablets along with the gems and other valuable things. Today, the texts are marked in black ink made from shellac, soot from paraffin lamps and straw ash and a few gems still exist. Built in 1859, the pagoda at the center of the complex is 57 meters tall. At the four corners of the pagoda are four large golden Chinthe, mythological lions that guard the pagoda. Besides, its bell rests on a base of three square receding tiers and on each side is a stairway rising to the base. The pagoda is topped with an ornamental spire shaped like an umbrella. Next to the pagoda is a small elegant open pavilion housing a Buddha image in the “Calling the Earth to the witness” posture, seated on an elaborate pedestal.